Kurt Michaelson: The Middle East conflicts and the return of Christ, are you ready? 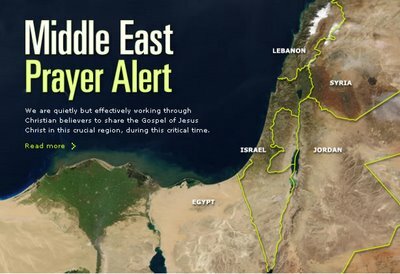 The Middle East conflicts and the return of Christ, are you ready? The following article links I feel are important that every person should read them. The ABC News article discusses the support Christians have for Israel and the need to pray for peace in Israel. Many of the events that have occurred, I believe, are preparations for the return of Christ. I am no expert theologian, nor one with the gift of prophesy. Something within my spirit tells me though that we will see the return of Jesus Christ in this generation. ABC News article: Save Israel, for Jesus? The article written by Billy Graham could not have been found at a better time to be communicated to the world. The only thing that a person must do, in order to receive God's gift of eternal salvation, is to give their life to Christ, recognizing and acknowledging His death on the cross as the satisfaction of payment to God for their personal sin against Him. Billy Graham article: Are You Saved? If you want to be absolutely certain that you will go to Heaven when your time comes, you can visit either of two websites to learn How to Know God or Steps to Peace with God, to begin a relationship with God through Jesus Christ. Will you be found innocent or guilty?